The following article about Tarra and Carol was published in the Merlian News, April 17, 2005. Imagine you are one of the lucky ones; one of the long-suffering elephants who finally roll up the driveway at The Elephant Sanctuary in Tennessee. Once the truck doors open, it’s your choice; you may back out, or stay there for hours. No one will force you, or raise their voice. What they will do is offer every treat known to elephants and finally you can no longer resist, and you step out into elephant paradise. And who will likely be the first elephant you will meet? Undoubtedly it will be the curious and loving Tarra— the sanctuary’s very first resident. Tarra was there, when shy Jenny arrived in 1999. "Jenny arrived at the Sanctuary and took her first step to freedom. Afraid and shy at first, she visibly relaxed when Tarra gently stroked Jenny's head with her trunk and finally coaxed her to entwine trunks! Everyone watched through tears of relief and joy at this obvious display of comfort and love." "Everyone watched in joy and amazement as Tarra and Shirley intertwined trunks and made "purring" noises at each other. Shirley very deliberately showed Tarra each injury she had sustained at the circus and Tarra then gently moved her trunk over each injured part. This really happened. It also happened that Tarra did not want to share the watermelons with Shirley ... but Carol made sure that Shirley got her fair share!" Tarra, aka Fluffie, is a female Asian elephant born in Burma, Asia. 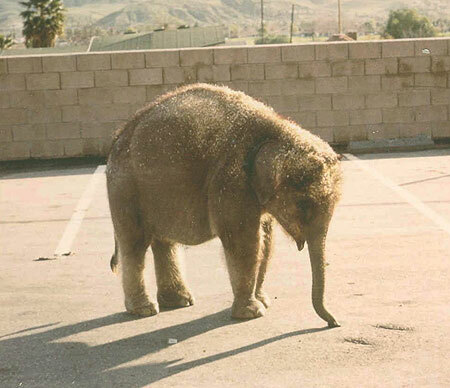 In 1974, when Tarra was only six months old, she was prematurely weaned and separated from her mother when she was sold to an animal broker who imported her into the United States. 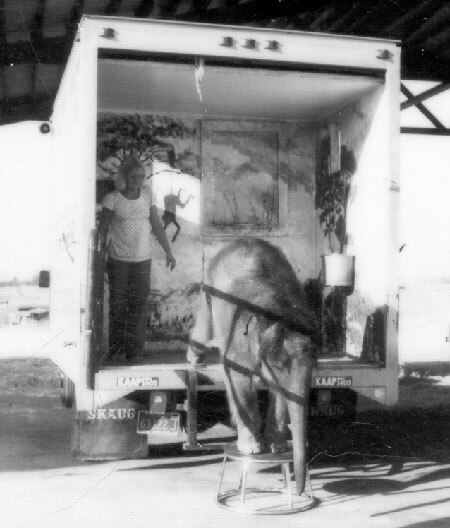 Tarra was flown in a small wooden crate from Thailand to California by cargo plane. A local businessman in Simi Valley, Ca. purchased Tarra, and named her Fluffie. Fluffie spent the next year and a half living in the back of a delivery truck. She lived in the parking lot of a tire dealer store by day, and a single-family residential home driveway by night. 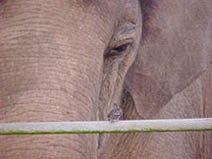 Shortly after Tarra's arrival in the USA, the Asian elephant was declared an endangered species, and all future importation of Asian elephants into America was halted. Carol Buckley, a first year student attending an exotic animal management course at a nearby college, learned of Fluffie's existence. She became her volunteer caretaker. Within months Fluffie was no longer spending her days cooped up in the back of a delivery truck. Carol arranged for Fluffie to spend a limited time on exhibit at the tire store, a few hours each Saturday and Sunday. The remainder of the week Fluffie was housed away from the tire store under Carol's care. By the time Fluffie was two years old, Carol, her full-time caretaker, purchased her and changed her name to Tarra. 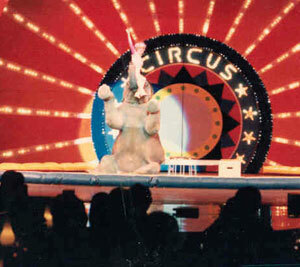 For the next two decades, Carol and Tarra traveled throughout the world "entertaining" audiences in circuses, amusement parks, zoos, on television, and in motion pictures. When not performing, Carol and Tarra lived in the small mountain town of Ojai, California, on a private compound located in the Los Padres National Forest. In 1980, Tarra became the world's only roller-skating elephant, a talent that served to display her intelligence, coordination, and grace. But it soon became apparent to Carol that although Tarra enjoyed playing on skates it sent the wrong message. Carol decided to retire Tarra's skating routine and concentrated on a more educational presentation. In the 80s, Tarra's engagements were primarily in zoos with an emphasis on education. Although very athletic, Tarra's abilities were not limited to sports. In 1986, "Tarra originals," custom watercolor artwork created by Tarra, were displayed at her hometown gallery. In the summer of 1991, Tarra was successfully bred in Ontario, Canada. After a twenty-two-month gestation period, Tarra began a very difficult labor that lasted two days and resulted in the delivery of a stillborn calf. Research indicates that first-time mother elephants, in the wild as well as in captivity, have a thirty-three percent rate of stillbirth with their first calf. 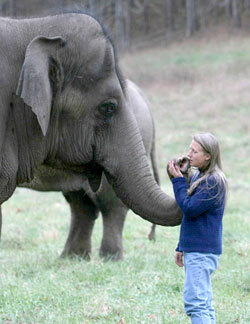 After ten years of envisioning an elephant sanctuary, Carol made her dream came true. This was to be her and Tarra’s forever home. 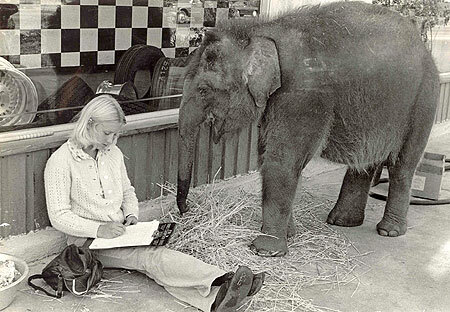 On March 3, 1995, after twenty-one years of entertaining the public, Tarra retired from show business, becoming the first resident of The Elephant Sanctuary in Hohenwald, Tennessee. In order to purchase the land and make necessary improvements to rescue needy elephants, Carol mortgaged the California home where she and Tarra had lived. It too was a magnificent piece of property nestled in the Los Padres National Forest, but Carol realized that in order to make her Sanctuary dream come true there would be many sacrifices. Funds were tight and the pressure was great to complete the facilities needed to rescue needy elephants. She used her life’s savings to underwrite the monthly mortgage payments on the Sanctuary property, the many improvements to the property, and Tarra’s continued care until the organization’s membership grew and more elephants arrived. For fifteen years, Tarra immersed herself in the habitat while Carol worked diligently, spreading the word about her dream. They met in the middle with frequents visits and walks in the habitat. 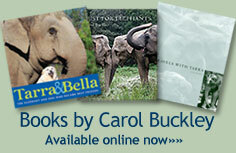 Carol’s vision was shared by many people who gave generously of their time and money. As result the Sanctuary grew from 112 to 2700 acres, from a small two-stall barn to three subdivided habitats for African elephants, Asian elephants and elephants in need of quarantine. 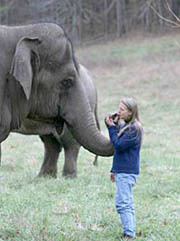 Tarra maintained her position as ambassador for the Sanctuary, greeting each new resident as she arrived. Relationship was recognized as the single most important component to each elephant’s rehabilitation and recovery. Being long lived, highly intelligent and emotional beings, the elephants and their caregivers formed strong bonds of trust and companionship. 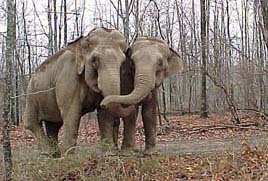 The multiple-decade long relationship shared between Carol and Tarra deepened and soon included all members of the herd; they became a family. 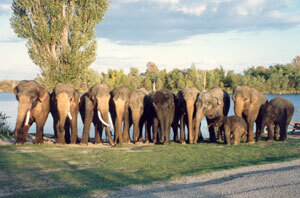 In the spring of 2010, after Carol had served elephants and the Sanctuary with unwavering dedication for fifteen years, the Sanctuary's Board of Directors made a drastic decision. It removed Carol, and one year later her co-founder Scott Blais, and changed the fundamental philosophy and practices on which the Sanctuary had been founded. The Sanctuary departed from its core focus on the emotional needs of the elephants first and foremost, with steel fencing and restraint chutes replacing elephant-caregiver relationships. The magnitude of this unexpected takeover sent shockwaves through the animal welfare community. Tarra has not been allowed to see Carol since April of 2010. The effect this has had on Tarra is not documented. Carol filed a lawsuit in order to reunite the two. The case is pending.